How Much Water Does A Golden Retriever Need? The importance of water to a dog’s well-being simply cannot be overstated. It aids digestion of food, helps to regulate body temperature, carry’s nutrients around the body, aids in proper kidney function and flushes out waste products. A dog can go for many days without food and can lose almost half their body’s weight of fats and proteins and still survive. But when a dog loses just 10% of their bodies water content, bodily functions start to shut down leading to serious and maybe even fatal consequences. Most owners are aware of this but what some either don’t know or tend to forget is that drinking too much water can be very dangerous too. Some dogs are prone to drinking too much, some to drinking too little, and any deviation from their normal drinking habits should be a cause for worry. So how much water does a golden retriever need? 6 So How Much Water Does A Golden Retriever Need? 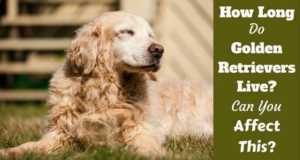 How much water your Golden retriever needs each day will depend on 6 factors: Their size, their age, their diet, local weather conditions, underlying health issues and activity levels. A good rule of thumb to use, as seen on ‘healthyPets‘ and ‘Pets.WebMD‘ is a dog requires about half to one ounce of water per pound of body weight per day. It stands to reason that a younger smaller puppy needs less water than an older larger one. You can cater for this using the 1/2 to 1 ounce per pound rule. Dogs don’t only get water from drinking, they also get some from the water content of their food. 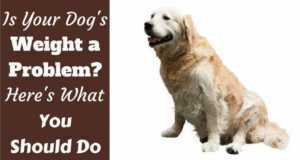 So if you feed your golden a wet food, they will drink less than if their diet consisted mostly of dry kibble. During the summer months when it’s hot outside, a dog will sweat and pant to control their body temperature. This expels water from their system that needs to be replaced. So in hotter weather, their water intake will be considerably more than in the cooler, winter weather. The amount of water a dog drinks is hugely affected by underlying illness or disease. Some issues, diabetes being one, can cause a dog to drink excessively. 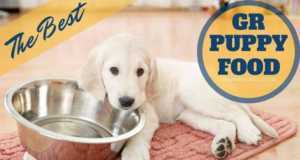 While others such as parvovirus can cause a dog to drink much less. The important thing to remember is if there’s a dramatic change in water consumption that lasts more than 48 hours, you need to see a vet right away. 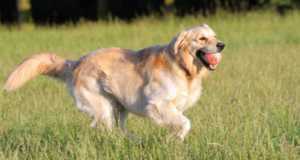 Any dog that takes part in vigorous and extended exercise will need more water than usual due to sweating and panting to control their internal temperature. 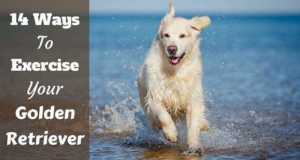 So take water with you when exercising your dog. Additionally, it’s important to give frequent smaller drinks and not a large amount at once. The easiest method to decide if your dog needs more water is to pinch the skin above their neck, pull it upwards and then let it go. It should very quickly snap back into place with a well hydrated dog, whereas on a dehydrated dog it will tend to fall back slowly, leaving a little tented area of skin for a few seconds. Another way to check is by inspecting your dogs gums. The gums of a healthily hydrated dog are pink and very moist. A dehydrated dog will have gums that are sticky or in very bad cases, dry. Furthermore, if you press your finger into the gum then it will turn white as it pushes the blood out. Upon taking your finger away it should instantly go back to pink. If it stays white for even a couple of seconds, then your dog is dehydrated and you need to get them to drink. Some dogs and especially young puppies are unable to regulate their water intake. It doesn’t happen often, but there are rare cases of puppies and dogs who will just drink and drink and drink until they make themselves ill. The symptoms of water intoxication can include a glazed look, excessive salivation, poor coordination, lethargy and in extreme cases even breathing difficulty, seizures and loss of consciousness. 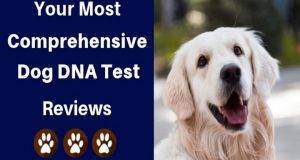 But even if excessive drinking doesn’t lead to any of these easily detected symptoms, there still could be something milder wrong with your Goldens health if their water intake increases. 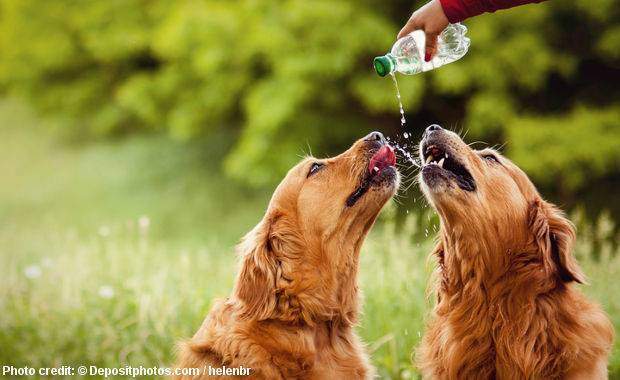 So if your golden suddenly starts to drink a lot more water than usual and you cannot explain it with higher activity levels or far hotter weather, you definitely shouldn’t ignore this and must consult your family vet. 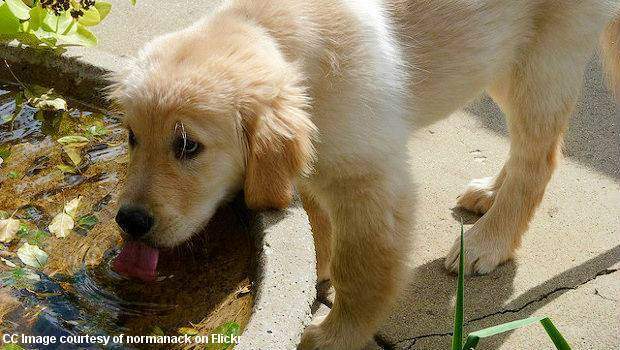 The first thing you must do if you notice your Golden drinking too much water is take them to your regular vet. Hopefully they’re given a clean bill of health and are just obsessive drinkers, for which your actions are easy enough. Make sure you’re aware of and can spot the symptoms of water-intoxication so it will never go unnoticed. Then quite simply ration the amount of water they are given. Plan out the amount of water they’re going to need for the day and only put it out in small quantities so they cannot guzzle it all down at once. Some in the morning, some in the afternoon, some in the evening and extra when hot or exercising. As always, the first thing you must do is consult your vet and have your dog thoroughly examined for any underlying health issues. Hopefully your Golden’s fit and healthy and are just ‘one of those dogs’ that tend to drink too little or ‘just kind of forget.’ It happens. The first is to increase the number of water bowls your dog has and place them in the areas they spend their time. If it’s there all the time, they’re more likely to drink it. Secondly, you can add flavorings to their water to make it more enticing. Many companies sell special chicken, beef and bone broths you can add to a dogs water. Give them a try! Lastly, you can spend some time on a little positive reward based training. Every time you see your Golden lapping at the water bowl, use a cue word like ‘Drink!’ and give some hearty praise and a little reward. Do this every time you catch them drinking and they should soon form an association between the word and the act of actually doing it. After just a few days of this, use the cue word to get your Golden to the water bowl and ask them to drink. If they do, praise and reward. If at first they’re hesitant or don’t understand, entice them to the bowl by luring them over with a treat held in your hand. Make them follow the treat over to the water bowl and ask them ‘drink’ and only give the treat if they do so. If this doesn’t work, go back to teaching them the cue word with praise and a reward when they are already drinking. Repeat this a few times so they have more chance to understand what you’re asking. Then try using the cue word when they’re not already drinking to see if they’ve learnt it. Praise and reward them if they have. It shouldn’t take long at all and once the cue word is trained, you can simply ask them to drink when you suspect they haven’t had enough. This is all you should have to do. Generally speaking, if you just always leave out a good supply of clean and fresh water, a dog will take care of their water needs themselves. Unfortunately though, the rare few just don’t seem able to regulate their water intake themselves. As responsible owners it’s up to us to make sure our dogs are getting just the right nutrition, and sometimes not too much, and that means not just with food but with water too. Monitor your dog’s or puppy’s water intake to make sure they aren’t having too much or too little, and regularly check with the skin and gum tests to make sure they aren’t dehydrated. You also monitor them to have a good idea of how much they usually drink so you’re able to spot any dramatic changes in their habits. A dog that usually drinks just what they need but suddenly starts to drink way more or way less is usually suffering an illness or disease. You need to spot this and take them to the vet. Aim to give your dog 0.5 oz to 1 oz of water per day for each pound of their body weight, depending on age, activity, weather and diet. And make sure their water is fresh and clean, regularly changing it 3 times per day and washing out their water bowl daily. If you see their water and think you wouldn’t want to drink it, there’s a good chance your dog is probably thinking same.